I have recently expanded my little family and wanted to share with you a bit about my new roommate, Leonardo (Leo)! I’ve only had him for a couple weeks now, and he’s such a sweet and calm baby. I wanted to introduce him here and give you all the low down about my experiences so far training him, the gear we’re rocking, and hopefully get some of your doggie advice too! A little back story, growing up my sister and I always had cats. Our mom was never on board with a dog because (rightfully so) she knew that she’d be doing all the work. Fast forward to now and my sister has a French Bulldog, my dad adopted a rescue who is part Chihuahua and part Jack Russell Terrier, and I just got a new little baby myself. I guess we’re a real dog family now. 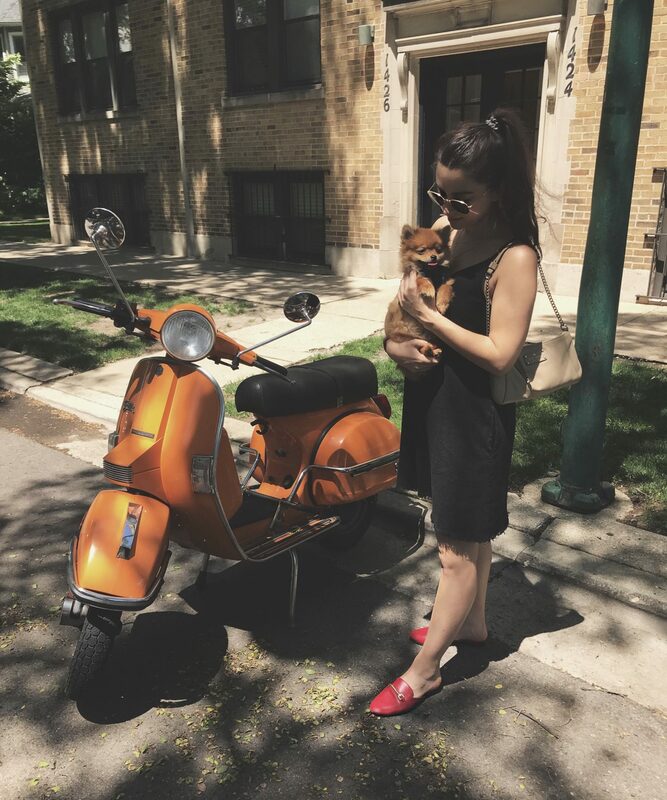 If you follow me on Instagram, you may have seen my many adventures in dog sitting with my sister’s Frenchie, Knox, and then recently with a friend’s Pomeranian, Phoebe. I’ve always wanted a dog, but thought it would be too much to manage. 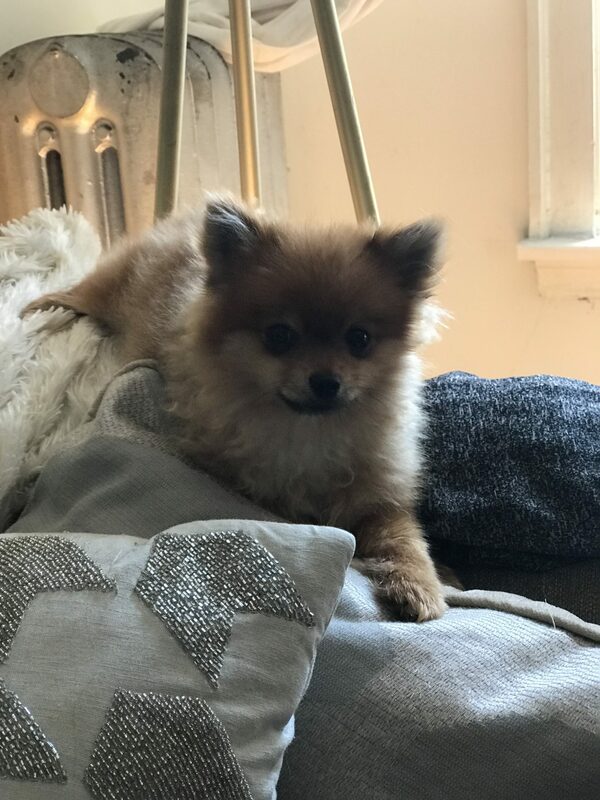 Phoebe was so calm and adorable, and being with her was so easy (due in part to her small size) that I decided to get a Pom of my own. Though they’re small, Pomeranians are very active and have a lot of energy so you can’t skip that daily walk. They actually used to be bigger, around 20-30 pounds (and looked totally different). They were bred down to this size by Queen Victoria of England who wanted them to be a lap dog. She is also responsible for popularizing them. Michelangelo painted the ceiling of the Sistine Chapel with a Pom by his side. They are named for a region on the south shore of the Baltic Sea called Pomerania. Mozart had a Pomeranian and even dedicated an aria to him. I actually got Leo from the same breeder as Phoebe, who happened to be in Dayton, Ohio — a lengthy five hours away from Chicago. But my very kind and loving boyfriend was down for the ride so we drove down there, picked up Leo and came back the same day. 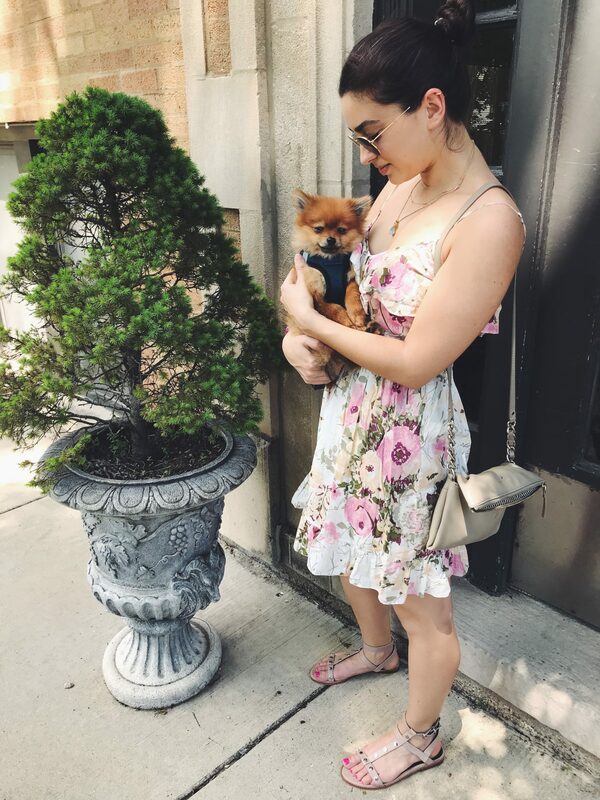 There were a few puppies to choose from, but I knew it was Leo once I picked him up and he was so calm and relaxed in my arms. (He was the most handsome one there too!) He’s six months old, which I preferred because I didn’t want to deal with the big job of taking care of a baby from eight weeks, and he’s fully grown at four pounds (that’s on the small side). He is also the cutest peanut ever. Leo was smiling the whole car ride home and I knew we’d made the right decision. He’s settled in very well, and I think he’s really loving all this individual attention, also known as complete spoiling. I have to remind myself to put him down because I could hold him all day he’s such a snuggle bug. He bonded with me rather quickly and has already shown signs of really trusting me, which is so sweet. He was originally really nervous about bath time and now trusts me completely, even though it’s not his favorite activity. Since coming home, we’ve been in baby boot camp! By that I mean, house breaking. This product has been a game changer in getting that done. I’ve set out a pee pad in the same place every time and before spraying the pad with the house breaking spray, he didn’t understand to go on there. Now, we have very few accidents already, and I reward him with treats when he does go on the pad. One of the tougher things has been socializing him. I work from home and don’t often have people over, so Leo is not very comfortable with people yet. I also think this has to do with the fact that he is six months old and was living in a house with a bunch of other dogs and only two people. So he’s actually pretty comfortable with other dogs, but gets locked up when we pass other people on our walks. Recently, I had a friend over and he got very protective of me and our house. He started barking like nuts (which he never does) and wouldn’t stop. As soon as we went outside all together, he was fine. If anyone has any suggestions on how I can improve this, I’m all ears. I like him to keep a little lookout, but not bark at friends coming over. With some trial and error, I’ve found some great accessories that work for both me and Leo and we are stylin’ now. It was very difficult finding a good harness for him. He’s so small that even the xs sizes in the pet stores didn’t fit well enough. My sister has a great harness for her dog, so I tried out the same one in his size , and it’s perfect. Very secure, and easy to get on (no threading pieces and wrapping around legs — who has time for that?). I have not seen a harness this good in any pet store I’ve been in. 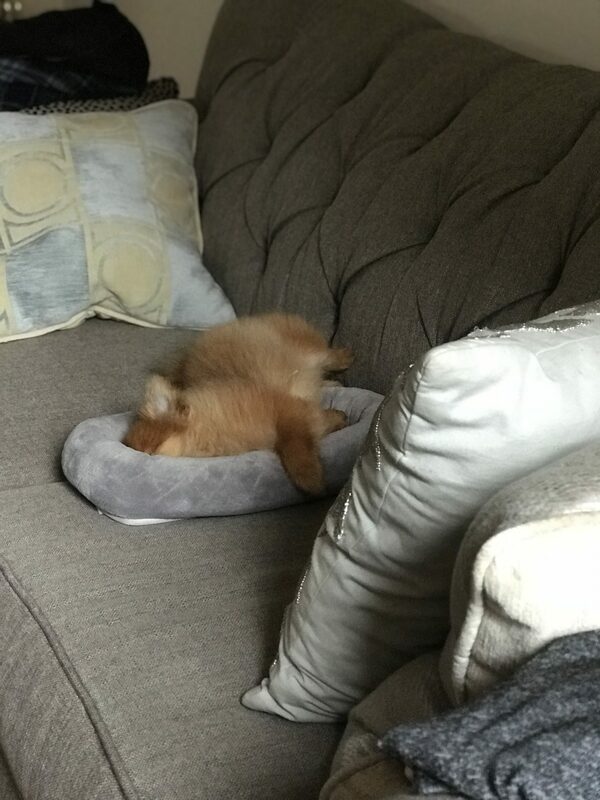 One thing I read about Pomeranians (and small dogs in general) is that they’re so small that they can really hurt themselves jumping on and off furniture. I never thought I’d have these in my life, but here I stand with little pet stairs headed up to my couch. Anything for baby. Like many dogs, we’re also positively *obsessed* with bully sticks . In doing my research on food, I landed on Blue Buffalo and their Basics line (for puppies of course) . He loves it, and it appears to be some of the best food out there. I am on the market for a good little brush, if anyone has any suggestions! All in all, it’s been an adjustment, but a very positive one and it’s fun taking care of a little life. He’s already brought me so much joy and makes me laugh everyday. I really believe and have seen the therapeutic effects that a dog can have in your life, as they are just pure love. It is a lifestyle change, but the pros outweigh the cons and you have a friend for life. 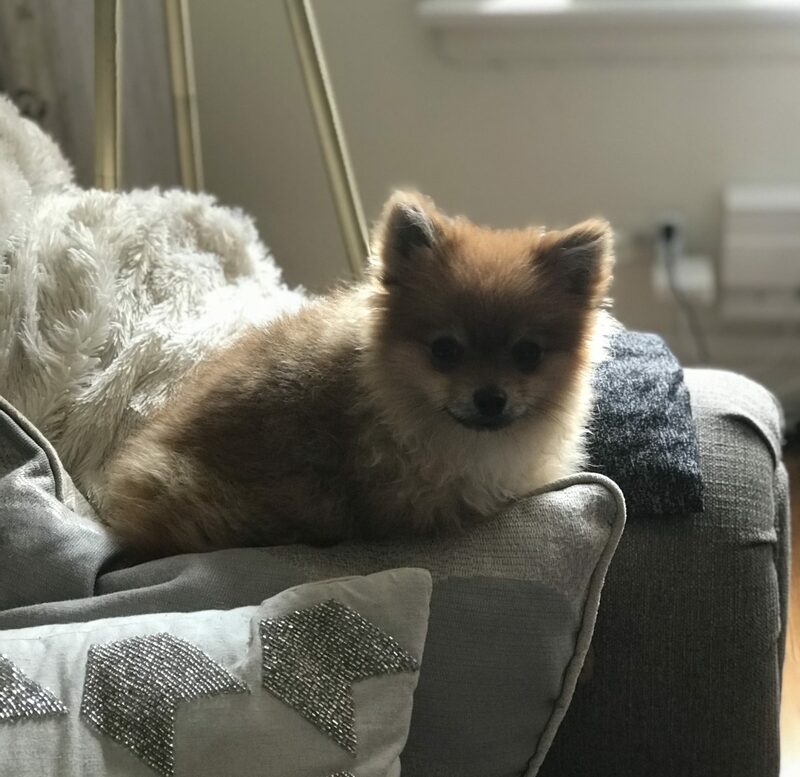 If anyone out there has a pom or another small dog, I’d love to hear your thoughts and advice! Omg the cutest thing. Your puppy is a blessing. Cherish every moment. I recently lost mine last month. The training might be a little hard but it’s all worth it with the love that you will receive from Leo. You will be an awesome dog mommy! Haha that is me everyday 😍 thank you so much!! I am fostering a three pound Chorkie and I have the same problem with finding gear that fits her. The xxs size is way too big and cumbersome for her. Congratulations on your new puppy! Oh my gosh, he is so adorable. haha thank you girl! I keep a close eye on him, ha! I just want to hug Leo and never let go! Have fun! He’s such an adorable little furry friend! 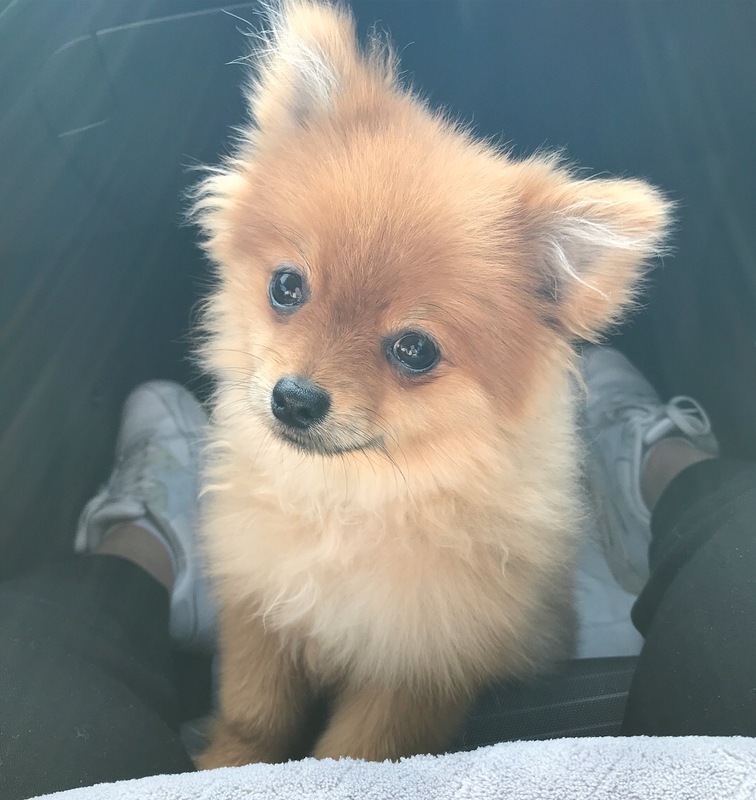 My aunt used to have a pom and he was a cutie pie too! Her pom would frequently start barking like crazy and be very territorial of their family and home (I believe this is a general trait of the dog). Ugh yes trying to address the territorial issue a little bit while he’s still a baby. He’s getting better, so I’m sticking with it! They are such cutie pies, all of them!! May I ask where you got him from? My mom and I would like one too. So sweet!! We’ve found that if you have your friends already in your house and then bring your dog in after them (as if they were there before you got home for example) Leo might not feel as if they were an intruder. This works for our dog (she’s a mutt) even now at her older age (8). Hope it works!